On this hilly land aside the gently flowing Raritan River, the native Lenape people hunted and fished. Their trails crisscrossed the land. Two of the earliest recorded European settlers in the Highland Park area were Henry and Mary Greenland who in 1675 owned 384 acres of land and operated an inn along the Mill Brook section of the Assunpink Trail. George Drake, Reverend John Drake and Captain Francis Drake, kinsmen to the famous explorer, also settled in the area with a group of dissident Baptists. In the early 1700s, a few wealthy Europeans settled on large tracts of land establishing an isolated farmstead pattern of development that would continue for the next 150 years. 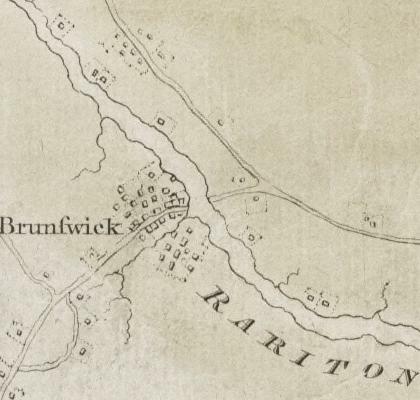 In 1685, John Inian bought land on both shores of the Raritan River and built two new landings further downstream from the Assunpink Trail's fording place. He established a ferry service and the main road then was redirected to lead straight to the ferry landing. This river crossing was run by generations of different owners until a toll bridge replaced the ferry in 1795. The wood plank Albany Street Bridge was dismantled in 1848 and reconstructed in 1853. The present day stone arch road bridge was built in 1892. It became the Lincoln Highway Bridge in 1914 and was widened in 1923. 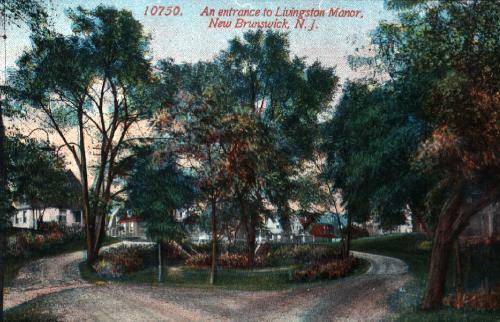 The Reverend John H. Livingston, newly chosen head of Queen's College, purchased a 150-acre plot of land in 1809, which would become known as the Livingston Manor. Now, a gracious Greek Revival house known as the Livingston Homestead stands at 81 Harrison Avenue. This house is surrounded by the homes that make up the Livingston Manor Historic District. The house was owned by the Waldron family throughout most of the 20th Century, and it remains Highland Park's most prominent historic building. In the 1830s, both the Delaware & Raritan Canal and the New Jersey Railroad were constructed. In 1836, the New Jersey Railroad and Transportation Company built a rail line that terminated on the Highland Park side of the Raritan River at a station named "East New Brunswick", a nickname that stuck for many decades. In 1838, the Camden and Amboy Railroad built a railroad bridge which eliminated the station stop. The two-tier, wooden railroad bridge carried pedestrians and wagons on its lower level. It was destroyed by fire in 1878. An iron truss bridge was quickly built upon enlarged stone piers, which in turn was replaced in 1902 by the twelve span, stone arch, railway bridge we see today. Even with the arrival of the canal and the railroad in the 1830s, Highland Park's land remained as farmland tracts. Development began 30 years later, with several of South Adelaide Avenue's stately homes and more modest houses constructed on Cedar, First , and Second Avenues, as well as on the newly formed cross streets of Magnolia, Benner, and Johnson. In 1870, our small hamlet changed names from "East New Brunswick" to "Highland Park", a name derived from the housing development on the south side streets. This was also the year that Highland Park was annexed to the newly formed Raritan Township. By 1885, the seeds were sewn for Highland Park's independence from Raritan Township over the issue of schooling for the locality's children. Township officials granted the formation of Highland Park's own school district and on March 23, 1886, a one-story Queen Anne style schoolhouse opened to 33 students at the corner of Benner Street and South Second Avenue. Miss Chrissie Bartle was the first teacher. 1905 marked the year when the Borough of Highland Park broke away from Raritan Township. Important factors contributing to the movement to incorporate were the desire for an independent school system and a related dispute over school taxes. The fire department, which had formed in 1899, also wanted more local control over their affairs. Over the past century, Highland Park's large farm and estate lands have been parceled into smaller suburban residential plots. Watson Whittlesey's Livingston Manor development, begun in 1906, is perhaps the best known example. There have been many other tract developments such as the Viehmann Tract, also on the north side, Riverview Terrace on the south side, Raritan Park Terrace in the triangle between Raritan and Woodbridge Avenues, and East New Brunswick Heights in the Orchard Heights neighborhood. By 1930, most of Highland Park's land had been subdivided and its streets mapped out. It has taken years of continuously constructing houses and apartment buildings to create our largely residential borough. Highland Park's industrial development in the 19th and 20th centuries has included such businesses as Johnson & Johnson, The John Waldron Machine Company, and the Janeway & Carpenter Wall-paper Factory. Our commercial zones along both Raritan and Woodbridge Avenues have been filled with many small family businesses, some which have lasted for generations. Throughout the 20th century, Highland Park's religious institutions, educational facilities, and municipal governance have kept pace with the growth of the town. The trends of local autonomy and control that shaped Highland Park in the past continue to this day.